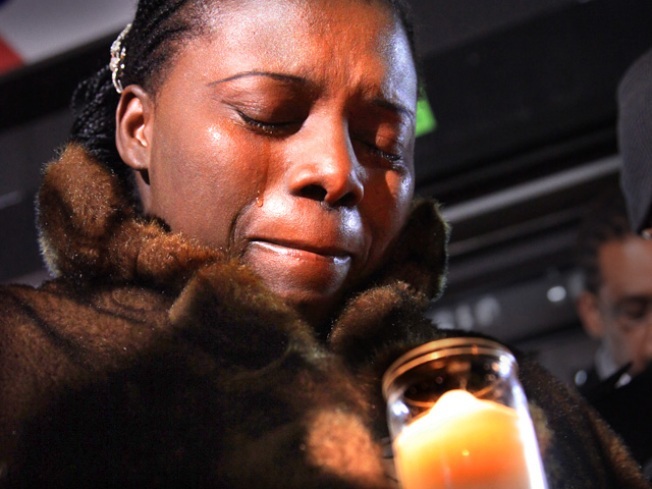 Luna Charles cries as she attends a vigil in Brooklyn borough of New York, Wednesday, Jan. 13, 2010. Charles, who has not been able to reach her family in Haiti following a 7.0-magnitude quake, said, "I hope people will extend a hand. Haiti needs us more than ever." Buried in the White House pledge to support Haiti's recovery from a crippling earthquake with money and troops was the announcement that the government is halting the planned deportation of 30,000 illegal Haitian immigrants. The step was supported by lawmakers on both sides of the aisle as a way of helping the embattled island nation deal with a worsening humanitarian crisis. Now there is a movement afoot to grant the estimated 125,000 illegal Haitians in the U.S. Temporary Protected Status (TPS). TPS is a program that grants immigrants from certain countries amnesty if they can't safely return to their homelands because of natural disasters, war and other hardships. People from El Salvador, Honduras, Nicaragua, Somalia and Sudan have already been designated for TPS. President Obama has resisted the call for granting Haitians TPS in the past, but the time could be right for a change in policy. "Mr. Obama should immediately extend [TPS] to Haitians so they can help their quake-stricken relatives at home," writes The Washington Post editorial board. They argue the move is overdue and should have been granted back in 2008 when the island was devastated by four storms in the space of a month. Newsweek's Arian Campo-Flores notes that critics often say the problem with "granting TPS to Haitians is that it will encourage a massive influx of new immigrants." In reality, "TPS benefits only those who are already in the U.S., not fresh arrivals." She writes that Hondurans and Nicaraguans benefited from TPS after Hurricane Mitch in 1998 and Salvadorans were granted the status after an earthquake in 2001. "As destructive as both those tragedies were, they don't match the apparent scale of devastation in Haiti," she notes. The Los Angeles Times' Johanna Neuman thinks the TPS issue will have major implications on the overall immigration debate and the urgency could force Obama's hand too early. "Now, given the utter destruction of the country's already-limited infrastructure, political pressure is likely to grow even further on the administration to let the illegals stay." Political pressure and other factors have convinced The Village Voice's Ward Harkavy that TPS for Haitians won't happen -- even though it should. "The Obama administration isn't showing much more heart than past U.S. regimes," he wrote. "It's a kind of backdoor refugee system," NumbersUSA Executive Director Roy Beck tells the National Journal. Beck, whose organization advocates lower immigration levels, notes that some other countries that enjoy TPS status are no longer in flux -- yet remain on the list. TPS should be renamed "PPS," for permanent protected status, he says.